Mar 06, 2017 Dear Kara, We understand that time has passed since your last positing, if you continue to have questions or concerns please contact us via customersupport@empiretoday.com. The first time i used empire they were late but did a good job, couldnt understand the workers but ah it happens so i decided to use them again, big mistake! They were late again i couldnt understand them and they stared at me like they had no clue what i was saying to them. I can visibly see the seams i have strings hanging everywhere in the carpet , its not connected in one spot on my step and not pulled tight . The tile in the bathroom looks fine but i have a chunk put of my door trim they used 2 different color trim and left grout everywhere for me to clean up .also was specific i had heated floor which is my only heat source and is now not working. it has been a week my house has been discombobulated waiting for repairs that still havent happened, the customer service is horrible and rude and like to talk over you and argue with you , i will never use them again ! Its ridiculous that they mess stuff up and dont even care ! Review #800869 is a subjective opinion of User800869. We regret that you've been experiencing issues with your products and that your concerns have not yet been addressed. We can assure you that this is not the experience we expect for our customers, and we would like to make things right for you. Unfortunately, we cannot locate your account with the information posted here. 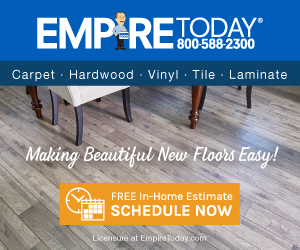 Please send your contact information to customersupport@empiretoday.com so that we can follow up with you. Thank you.